Maria Carmina Colavecchio first appears in the Painesville, Ohio, area in 1907. In America, Maria Carmina Colavecchio was known by her married name, Mary Jiusto. Maria Carmina Colavecchio, daughter of Nicola Colavecchio and Vittoria Carderelli, was born on August 7, 1890, at Frosolone, Italy. She married Emiddio Giusti, son of Domenico Giusti and Emerenziana Scacciavillano, on November 14, 1907 at St. Mary Catholic Church at Painesville, Lake County, Ohio. Maria died on September 25, 1962, at age 72. Maria Carmina Colavecchio immigrated to the United States on August 10, 1907, at age 17, travelling to Painesville, Lake County, Ohio. She was joining her brother, Felicantonio Colavecchio, who migrated to Painesville in 1904 or 1905. 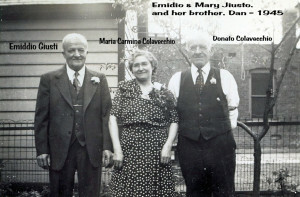 Her brothers, Donato Colavecchio and Giuseppe Colavecchio, also lived in Painesville, at one time or another. 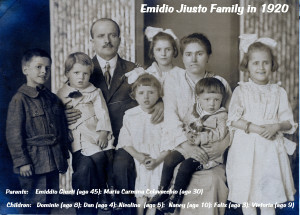 The Emiddio Giusti family moved to Schenectady, New York, between 1913 or 1914. 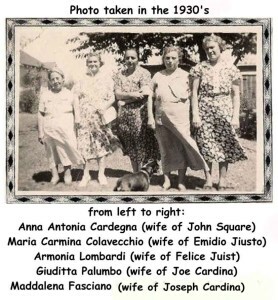 Maria Carmina’s brother, Donato Colavecchio, also moved his family to Schenectady, probably at the same time.